IDTechEx forecasts, in its new report “3D Printing Materials 2014-2025: Status, Opportunities, Market Forecasts”, that the market will not reach a fully competitive state by 2025 and therefore boasting the value to US$615 million as a result of premium charging on materials. However, should a fully competitive market environment emerge, IDTechEx says predicts the market value in 2025 will only be US$244 million.In 2013 the total volume of 3D printing materials being produced should reach 1,980 tons. Premium pricing is being maintained by some 3D printer manufacturers by the practice of locking end-users into their own materials supplies through key coding and RFID tagging under the guise of “quality control”. Whilst hard data concerning pricing is hard to come by, some end-users have revealed both the practice and the prices, some of which are hundreds of times the commodity price for similar materials, according to IDTechEx. Further, prices are being maintained at a high level long after research & development (R&D) costs have been recouped. This anti-competitive behavior is preventing the development of an efficient, competitive market for 3D printing materials and is presenting very high barriers to entry for new suppliers. Perhaps most importantly of all, IDTechEx notes, it is hindering the development of new materials for 3D printing. Price maintenance would see the total market for 3D printing materials reach nearly US$600m by 2017, the largest segment of which is the market for photopolymers, closely followed by thermoplastics in solid (i.e. filament or pellet) form. However, this scenario is unsustainable as new printer manufacturers are established and larger end-users exert downwards price pressure on the materials market. 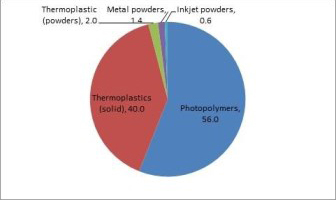 Looking ahead to 2025, photopolymers will remain the largest single market for 3D printing materials. However this market will lose ground and the highest compound annual growth rates will be seen in the markets for metal and plastic powders currently produced at around 30 and 40 tons per year respectively. Achieving the desired mechanical, thermal and chemical resistance properties of a 3D printed object is a complex interplay between process parameters and feedstock material properties for any 3D printing technology. End-users want to 3D print with the materials they are used to and want the final properties to match those possible with traditional manufacturing methods such as injection molding. However this is no easy task. Key to growth for any individual 3D printer manufacturer on the materials front is to gain in share of installed base. This would be a much more effective strategy for increasing revenues from materials than to increase or maintain material prices.